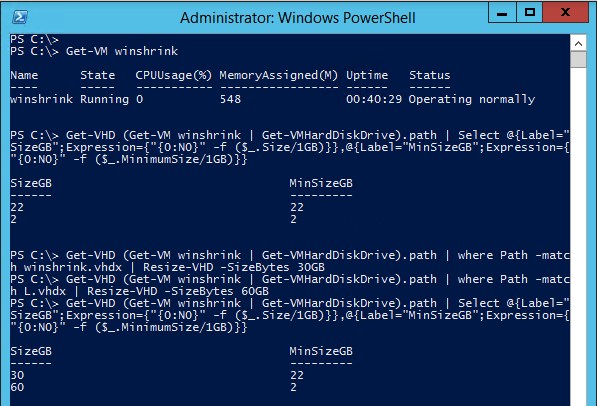 As I described in an earlier post about why you should think about creating VM´s with Windows 2012 now when the Windows 2012 R2 have arrived I have now tested the online VHDX resize function. I have not yet successfully migrated a Gen 1 VM´s system disk to a Gen 2 but I am working on it 😛 (the Gen 2 uses UEFTI and GPT) and some kind of backup/restore will probably be required.. I will post updates in my pursue of this task. In the following part of this post I want to show you how I resize both a VHDX with the system and boot partition on it and an additional VHDX with data on the VM running on the Generation 2. As you can see with this PowerShell I can easily extend the VHDX and also with the following command I can get the minimum size that I can shrink it to, this depends on the volume inside and that can also be shrunk online of course, that has been possible since Windows 2008. I have also gone through this case in an earlier post, the main difference here with R2 is that it can be done online. So to resize during the VM is running is shown here in the following screendump, and as you can see, both the system drive and the L-drive are extended. And here you can see how we can shrink the VHDX also, note that I have extended the system volume with 3 GB inside the VM also so the minimum have gone up all this when the VM was running! Hey Gil, I think that first you must shrink the volume within the OS on the virtual disk before being able to shrink it, that will prevent possible data corruption, I followed the steps here which were able to do this no problems. http://www.rootusers.com/decreasing-disk-space-in-windows-server-2012-r2/ good luck!